DIE Lunæ, 1 die julii. Archbishop of Cant's Trial put off. House not to sit Tuesdays and Thursdays. and for an Answer about The States Ambassadors, &c.
Report concerning the Warrant from the Committee at Haberdashers Hall, for attaching the E. of Thanet. Commissions taken upon Servants who came up with the E. of Leicester. and to expedite an Ordinance. Message from the H. C. to expedite an Ordinance. and with the High Sheriff's Name for Dorset. 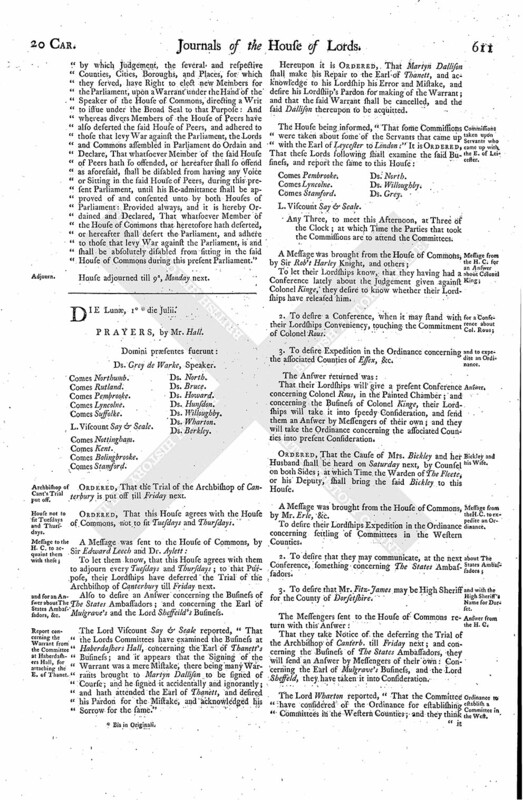 Ordinance to establish a Committee in the West. Ordinance for associating the Counties of Essex, &c.
Ordinance for establishing a Committee in the West. DIE Lunæ, 1 (fn. 1) die julii. Ordered, That the Trial of the Archbishop of Canterbury is put off till Friday next. Ordered, That this House agrees with the House of Commons, not to sit Tuesdays and Thursdays. To let them know, that this House agrees with them to adjourn every Tuesdays and Thursdays; to that Purpose, their Lordships have deferred the Trial of the Archbishop of Canterbury till Friday next. Also to desire an Answer concerning the Business of The States Ambassadors; and concerning the Earl of Mulgrave's and the Lord Sheffeild's Business. The Lord Viscount Say & Seale reported, "That the Lords Committees have examined the Business at Haberdashers Hall, concerning the Earl of Thanett's Business; and it appears that the Signing of the Warrant was a mere Mistake, there being many Warrants brought to Martyn Dallison to be signed of Course; and he signed it accidentally and ignorantly; and hath attended the Earl of Thanett, and desired his Pardon for the Mistake, and acknowledged his Sorrow for the same." Hereupon it is Ordered, That Martyn Dallison shall make his Repair to the Earl of Thanett, and acknowledge to his Lordship his Error and Mistake, and desire his Lordship's Pardon for making of the Warrant; and that the said Warrant shall be cancelled, and the said Dallison thereupon to be acquitted. L. Viscount Say & Seale. Ds. North. Any Three, to meet this Afternoon, at Three of the Clock; at which Time the Parties that took the Commissions are to attend the Committees. To let their Lordships know, that they having had a Conference lately about the Judgement given against Colonel Kinge, they desire to know whether their Lordships have released him. 2. To desire a Conference, when it may stand with their Lordships Conveniency, touching the Commitment of Colonel Rous. 3. To desire Expedition in the Ordinance concerning the associated Counties of Essex, &c.
That their Lordships will give a present Conference concerning Colonel Rous, in the Painted Chamber; and concerning the Business of Colonel Kinge, their Lordships will take it into speedy Consideration, and send them an Answer by Messengers of their own; and they will take the Ordinance concerning the associated Counties into present Consideration. Ordered, That the Cause of Mrs. Bickley and her Husband shall be heard on Saturday next, by Counsel on both Sides; at which Time the Warden of The Fleete, or his Deputy, shall bring the said Bickley to this House. A Message was brought from the House of Commons, by Mr. Erle, &c.
To desire their Lordships Expedition in the Ordinance concerning settling of Committees in the Western Counties. 2. To desire that they may communicate, at the next Conference, something concerning The States Ambassadors. 3. To desire that Mr. Fitz- James may be High Sheriff for the County of Dorsetshire. That they take Notice of the deferring the Trial of the Archbishop of Canterb. till Friday next; and concerning the Business of The States Ambassadors, they will send an Answer by Messengers of their own: Concerning the Earl of Mulgrave's Business, and the Lord Sheffeld, they have taken it into Consideration. That this (fn. 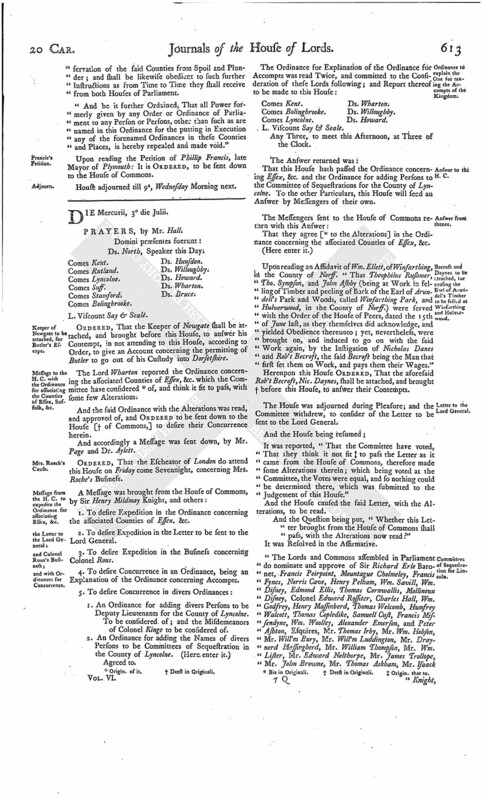 3) House agrees to the Ordinance concerning the settling of Committees in the Western Counties; and that Mr. Fitz-James be nominated High Sheriff for the County of Dorsetshire; and that their Lordships will hear what the House of Commons will deliver at the next Conference, concerning The States Ambassadors. Ordered, That the Business of Colonel Kinge is referred to the Grand Committee of Privileges, to consider of that which concerns the Breach of Privilege in that Business; and the Earl of Suffolke, the Lord Willoughby of Parham, Lord Hunsdon, and the Lord Bruce, are added to the said Committee. Their Lordships, or any Five, to meet this Afternoon, at Three of the Clock, at which Time the Judges are to attend. The Lord Wharton reported from the Committee (fn. 3) the Ordinance for the associated Counties of Essex, (fn. 3) &c. as fit to pass, with some few Alterations. Ordered, To be read on Wednesday next. The Lords went to the Conference. 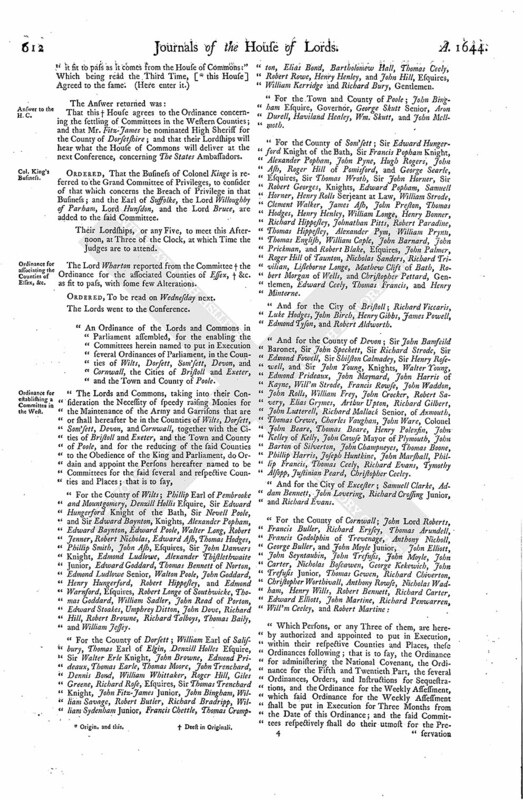 "An Ordinance of the Lords and Commons in Parliament assembled, for the enabling the Committees herein named to put in Execution several Ordinances of Parliament, in the Counties of Wilts, Dorsett, Som'sett, Devon, and Cornwall, the Cities of Bristoll and Exeter, and the Town and County of Poole. "For the County of Wilts; Phillip Earl of Pembrooke and Mountgomery, Denzill Hollis Esquire, Sir Edward Hungerford Knight of the Bath, Sir Nevell Poole, and Sir Edward Baynton, Knights, Alexander Popham, Edward Baynton, Edward Poole, Walter Long, Robert Jenner, Robert Nicholas, Edward Ash, Thomas Hodges, Phillip Smith, John Ash, Esquires, Sir John Danvers Knight, Edmond Ludlowe, Alexander Thistlethwaite Junior, Edward Goddard, Thomas Bennett of Norton, Edmond Ludlowe Senior, Walton Poole, John Goddard, Henry Hungerford, Robert Hippesley, and Edmond Warnford, Esquires, Robert Longe of Southwicke, Thomas Goddard, William Sadler, John Read of Porton, Edward Stoakes, Umphrey Ditton, John Dove, Richard Hill, Robert Browne, Richard Talboys, Thomas Baily, and William Jessey. "For the County of Dorsett; William Earl of Salisbury, Thomas Earl of Elgin, Denzill Holles Esquire, Sir Walter Erle Knight, John Browne, Edmond Prideaux, Thomas Earle, Thomas Moore, John Trenchard, Dennis Bond, William Whittaker, Roger Hill, Giles Greene, Richard Rose, Esquires, Sir Thomas Trenchard Knight, John Fitz-James Junior, John Bingham, William Savage, Robert Butler, Richard Bradripp, William Sydenham Junior, Francis Chettle, Thomas Crompton, Elias Bond, Bartholomew Hall, Thomas Ceely, Robert Rowe, Henry Henley, and John Hill, Esquires, William Kerridge and Richard Bury, Gentlemen. "For the Town and County of Poole; John Bingham Esquire, Governor, George Skutt Senior, Aron Durell, Haviland Healey, Wm. Skutt, and John Mellmoth. "For the County of Som'sett; Sir Edward Hungerford Knight of the Bath, Sir Francis Popham Knight, Alexander Popham, John Pyne, Hugh Rogers, John Ash, Roger Hill of Pomisford, and George Searle, Esquires, Sir Thomas Wroth, Sir John Horner, Sir Robert Georges, Knights, Edward Popham, Samuell Horner, Henry Rolls Serjeant at Law, William Strode, Clement Walker, James Ash, John Preston, Thomas Hodges, Henry Henley, William Longe, Henry Bonner, Richard Hippesley, Johnathan Pitts, Robert Paradine, Thomas Hippesley, Alexander Pym, William Prynn, Thomas English, William Caple, John Barnard, John Prickman, and Robert Blake, Esquires, John Palmer, Roger Hill of Taunton, Nicholas Sanders, Richard Trivilian, Lisleborne Longe, Mathew Clift of Bath, Robert Morgan of Wells, and Christopher Pettard, Gentlemen, Edward Ceely, Thomas Francis, and Henry Minterne. "And for the City of Bristoll; Richard Viccaris, Luke Hodges, John Birch, Henry Gibbs, James Powell, Edmond Tyson, and Robert Aldworth. "And for the County of Devon; Sir John Bamfeild Baronet, Sir John Speckett, Sir Richard Strode, Sir Edmond Fowell, Sir Shilston Calmadey, Sir Henry Rosewell, and Sir John Young, Knights, Walter Young, Edmond Prideaux, John Maynard, John Harris of Kayne, Will'm Strode, Francis Rowse, John Waddon, John Rolls, William Frey, John Crocker, Robert Savery, Elias Grymes, Arthur Upton, Richard Gilbert, John Lutterell, Richard Mallack Senior, of Axmouth, Thomas Crewe, Charles Vaughan, John Ware, Colonel John Beare, Thomas Beare, Henry Polexfin, John Kelley of Kelly, John Cawse Mayor of Plymouth, John Barton of Silverton, John Champneyes, Thomas Boone, Phillip Harris, Joseph Huntkine, John Marshall, Phillip Francis, Thomas Ceely, Richard Evans, Tymothy Alsopp, Justinian Peard, Christopher Ceeley. "And for the City of Excester; Samuell Clarke, Addam Bennett, John Lovering, Richard Crossing Junior, and Richard Evans. "Which Persons, or any Three of them, are hereby authorized and appointed to put in Execution, within their respective Counties and Places, these Ordinances following; that is to say, the Ordinance for administering the National Covenant, the Ordinance for the Fifth and Twentieth Part, the several Ordinances, Orders, and Instructions for Sequestrations, and the Ordinance for the Weekly Assessment, which said Ordinance for the Weekly Assessment shall be put in Execution for Three Months from the Date of this Ordinance; and the said Committees respectively shall do their utmost for the Pre servation of the said Counties from Spoil and Plunder; and shall be likewise obedient to such further Instructions as from Time to Time they shall receive from both Houses of Parliament. "And be it further Ordained, That all Power formerly given by any Order or Ordinance of Parliament to any Person or Persons, other than such as are named in this Ordinance for the putting in Execution any of the forenamed Ordinances in these Counties and Places, is hereby repealed and made void." Upon reading the Petition of Phillip Francis, late Mayor of Plymouth: It is Ordered, to be sent down to the House of Commons. House adjourned till 9a, Wednesday Morning next.